The Garota da Urca Bar (Av. 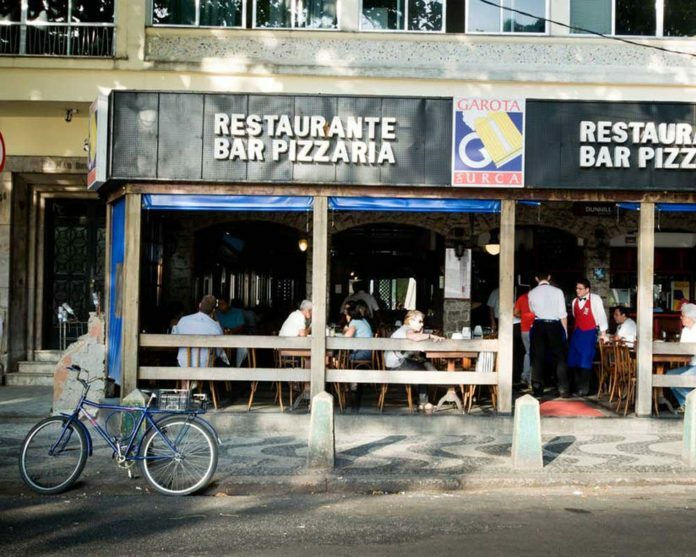 Joao Luiz Alves 56) is one of the few remaining locations of the original Garota de Ipanema (Girl from Ipanema) chain that dates all the way back to the early 60’s and its namesake Veloso Bar in Ipanema. Urca is home to many of Brazil’s music and media stars and Alves is the main street which weaves its way around the perimeter of the bay. Located across from the Praia da Urca, this ‘off the beaten path’ pub hotspot is nestled into a quiet neighborhood at the base Sugarloaf Mountain; the Urca hill to be exact. Moderately priced and an excellent value, this bayside pub has a great after dark vibe, thanks to the local crowd and a stunning view of Rio’s swanky Yacht Club and the towering Cristo Redentor atop Corcovado in the background. My introduction to Garota da Urca was via a casual comment from a carioca friend who was driving us to the airport, and of course, we were… late. “Let’s stop for a drink,” he said as he turned off the freeway and down into a maze of tight streets with traffic to match. “The planes never leave on time.” So we parked that car and walked a few picturesque, cobbelstoned blocks to the bar, where the Sunday evening crowd has spilled out onto the sidewalk. The bar’s curbside appeal makes this a great place to meet up with friends after a day of sightseeing or the beach, and while the service is friendly and usually quick, crowds can slow things down. The menu delivers more than you’d expect as a passer-by: with a well-known reputation for great pizza and a variety of nocturnal noshes, like pasteis: flakey pastry pillows filled with cheeses, shrimp or meats. More than just peckish? Try the Picanha for three, with tasty fries and other sides. Wash it down with an ice cold chope (draft beer). This place also serves up a mightily persuasive caipirinha. Serious sippers can request from a selection of very smooth 12-year cachaças. So go ahead. Spend sped time in Urca. You’ll have a great time, maybe make a few new friends and still make your flight from Jobim International. You can take a virtual stroll of the neighborhood by clicking here.